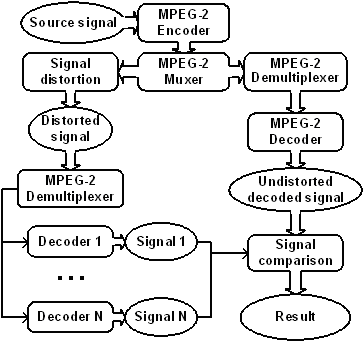 The main task was to comparatively evaluate quality of MPEG-2 decoders while decoding distorted streams. This question is topical for satellite broadcasting and, in a lesser degree, for DVD video playback. A sequence was encoded in MPEG-2 Elementary Stream with constant 3 Mb/s bitrate. The obtained stream was transformed to the MPEG-2 Transport Stream. The data were randomly distorted using a specially written utility. The probability of introducing bit error was regulated. The first header of the stream was kept intact in all cases. 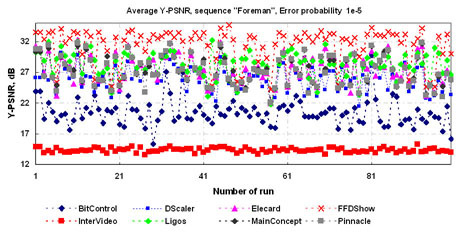 The distorted data were decoded using different decoders and the obtained sequences were compared with the undistorted decoded sequences using objective metrics. The process of introducing errors, decoding and metrics calculation was repeated 100 times to achieve more adequate results. This was reasoned by the fact that opportunity of effective error correction or error effects mitigation depends in many respects on the error position in a stream. If some decoder failed to decode a frame, the gray frame was inserted in the output stream. For the sake of per-frame comparison the Y-PSNR value for such frames was set to 0. The metrics values were averaged. This comparison was performed on the sequences "Foreman" and "Battle". The large amount of data was obtained, the part of them was visualized and shown in this report. As an addition a 7limited encoders test was performed. Its results are also presented in this report. It was discovered that the visual quality of decoded corrupted streams when using different decoders is quite different.